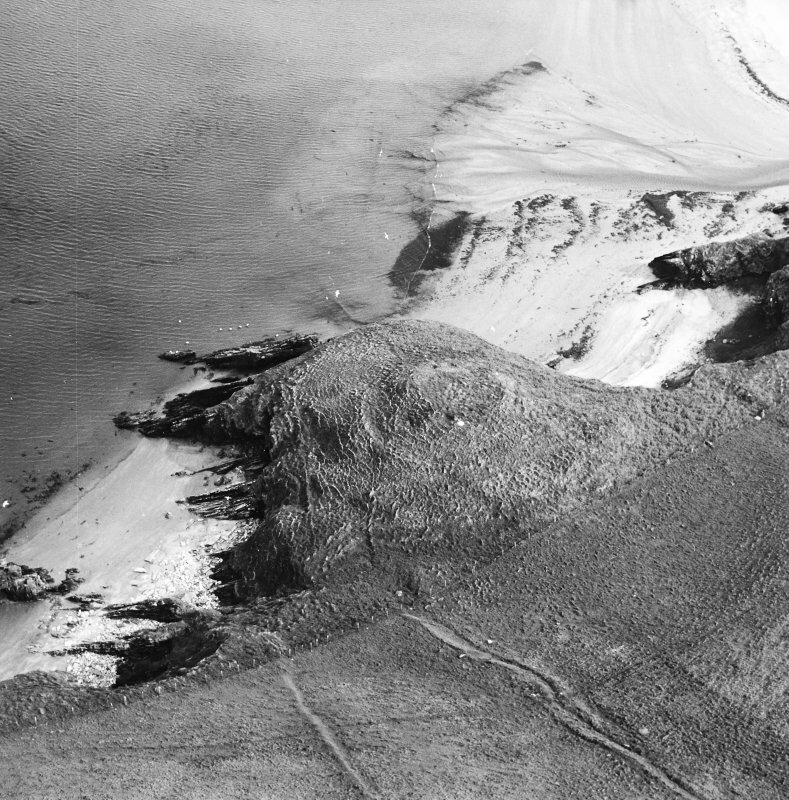 Oblique aerial view centred on the remains of the broch with the remains of the farmstead adjacent, taken from the NE. 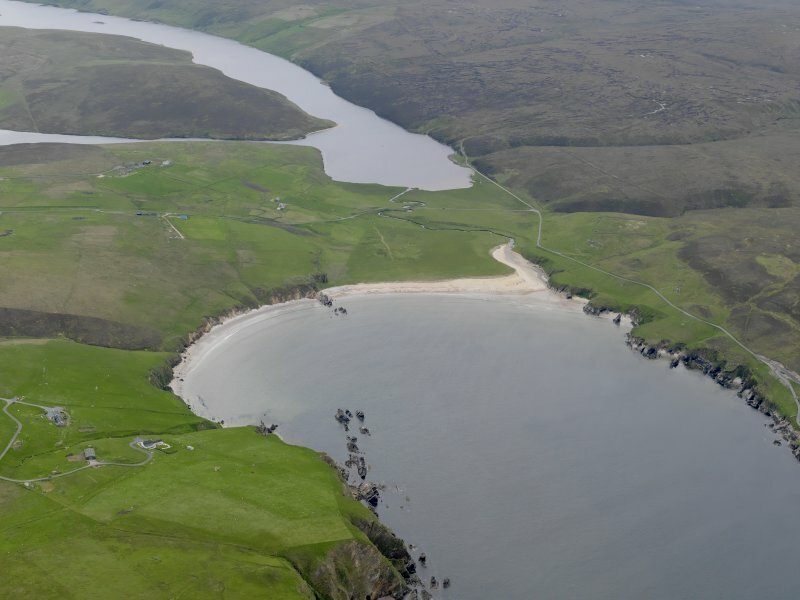 General oblique aerial view of Burrafirth with the Loch of Cliff beyond, looking SW.
Oblique aerial view of the remains of the broch, taken from the SE. 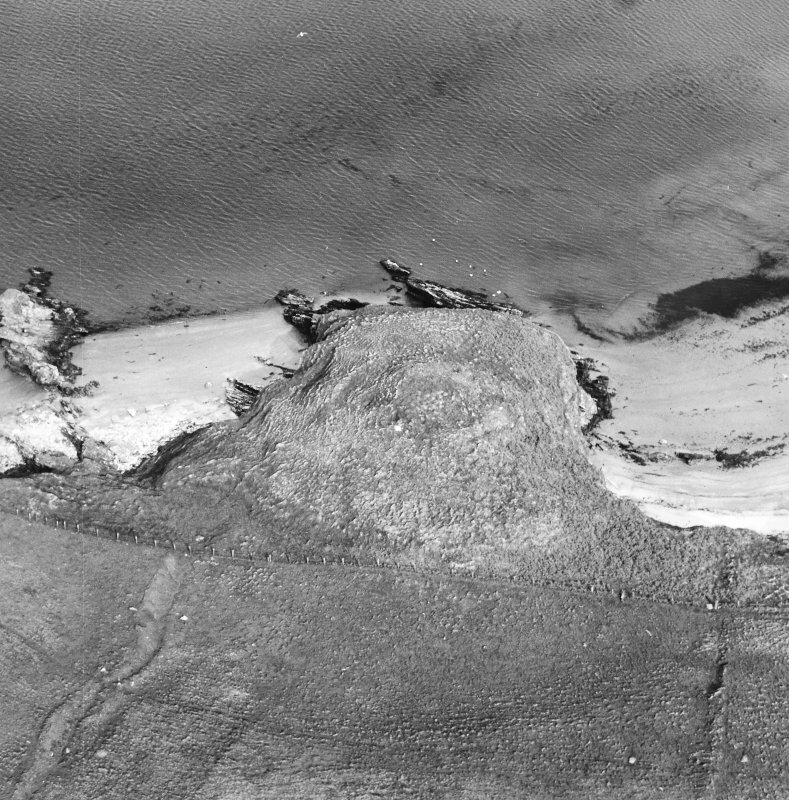 Oblique aerial view centred on the remains of the broch, taken from the ENE. 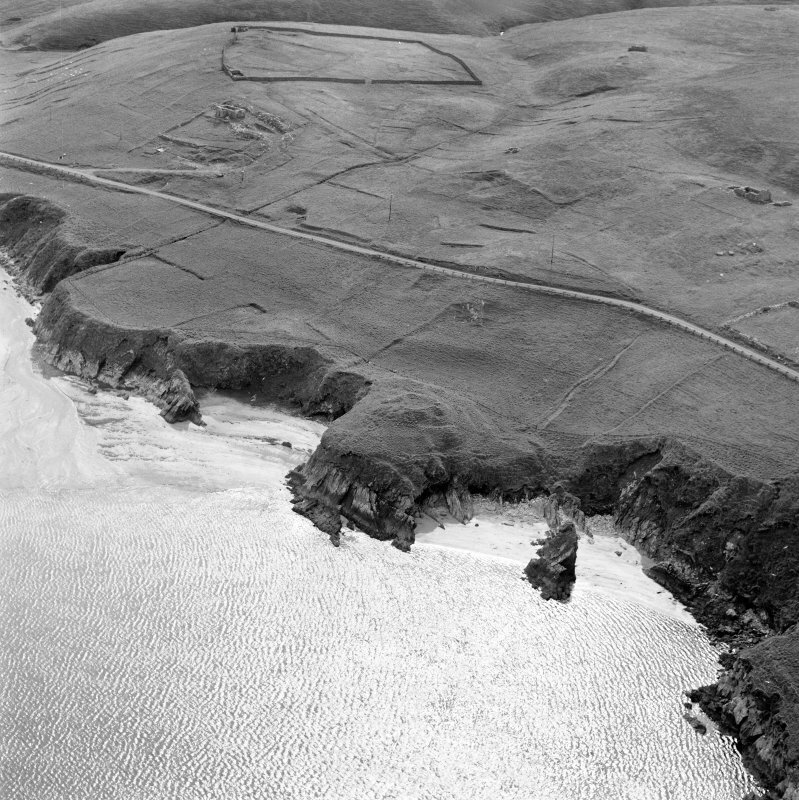 Oblique aerial view centred on the remains of the broch with the remains of the farmstead adjacent, taken from the NNE. 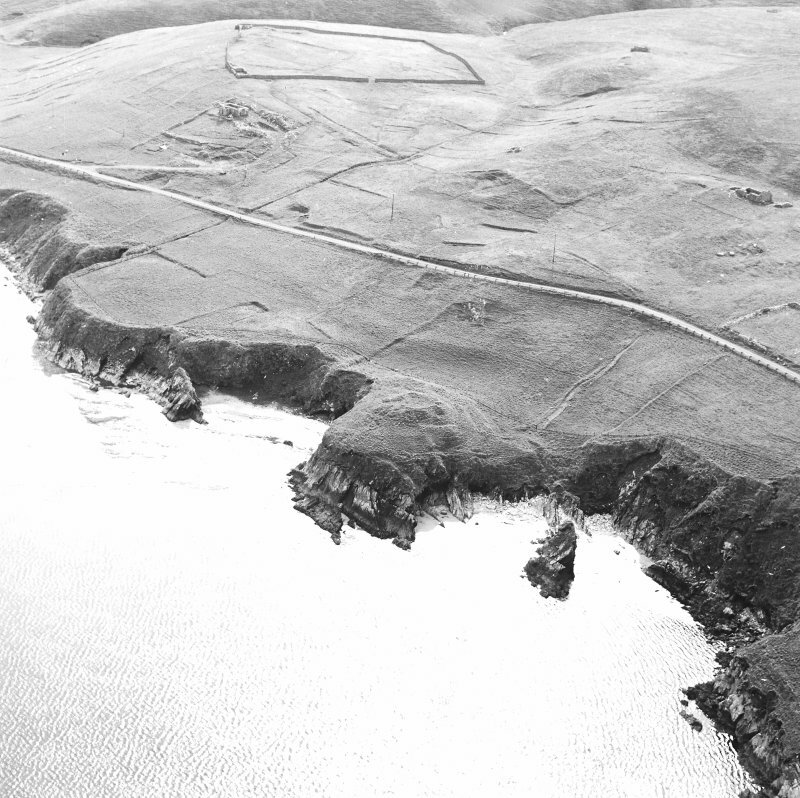 Oblique aerial view centred on the remains of the broch with the remains of the farmstead, enclosure and field-system adjacent, taken from the E.
Oblique aerial view centred on the remains of the broch with the remains of the farmsteads, enclosures, structures, head-dyke and field-system adjacent, taken from the ENE. 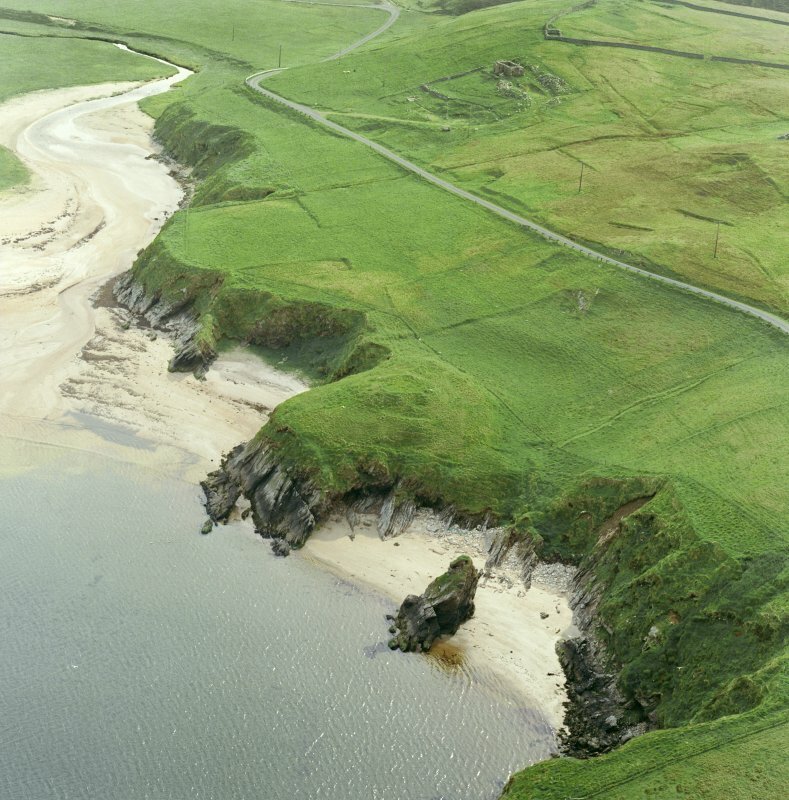 Oblique aerial view centred on the remains of the broch with the remains of the farmstead adjacent, taken from the ESE. 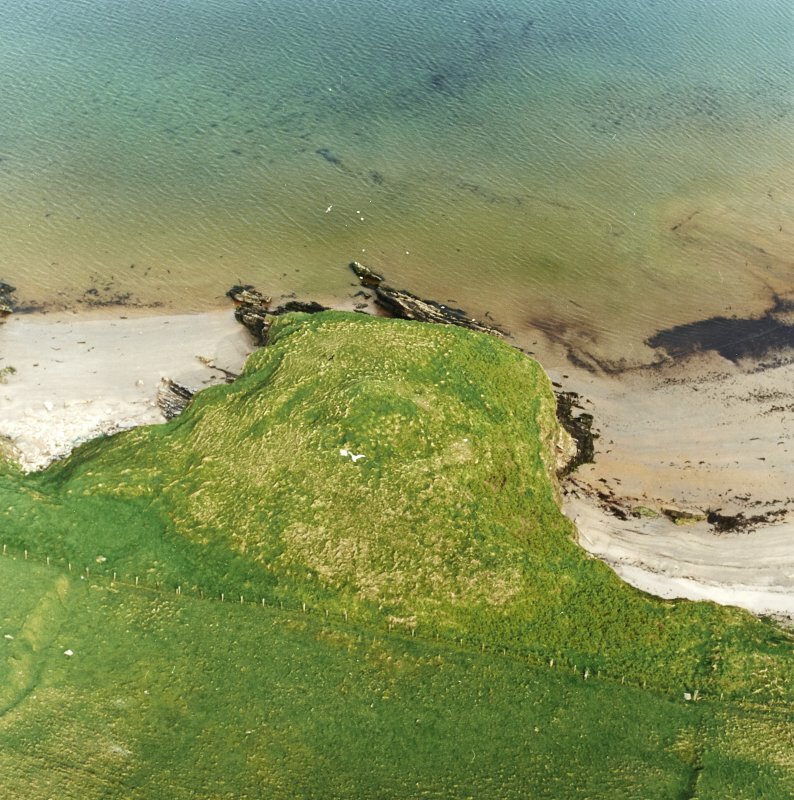 The remains of a broch, now concealed within a circular mound, on top of which many stones project through the turf, though there are no signs of actual masonry. 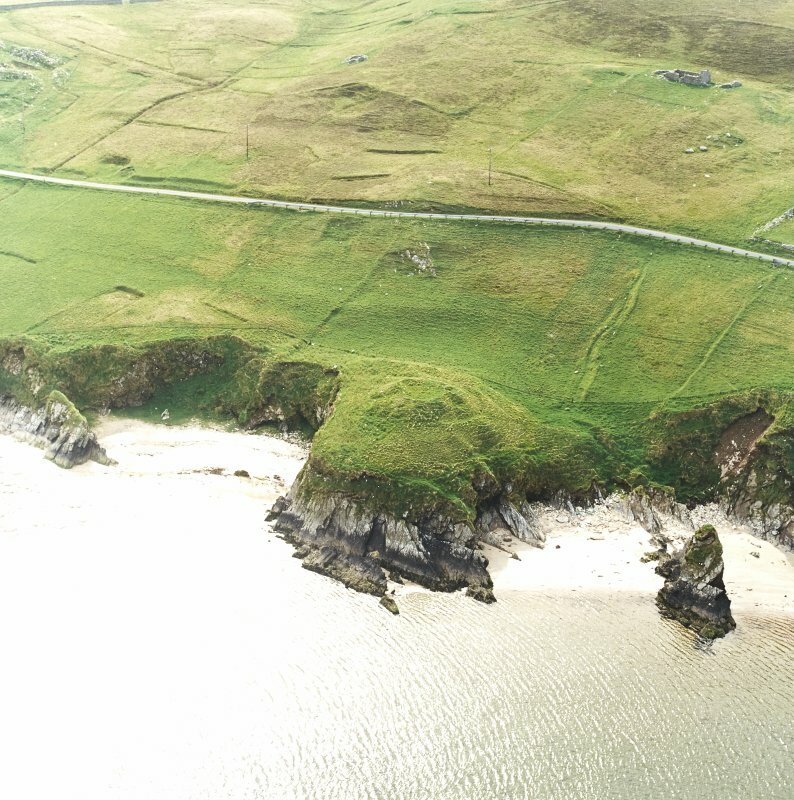 The external diameter of the broch has probably been from 55' to 58'. 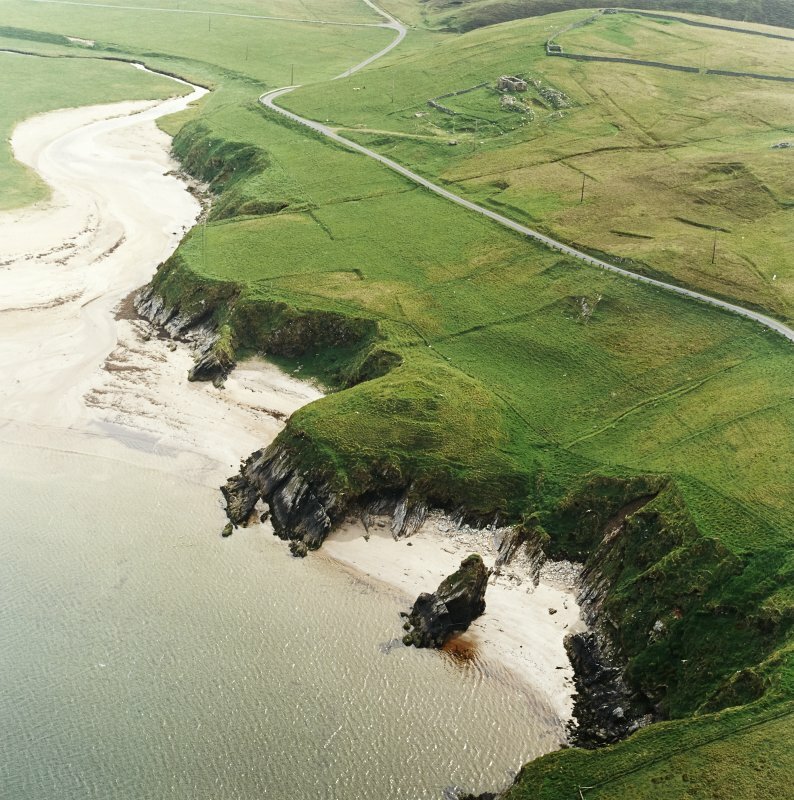 The elevation representing the broch itself is some 6' to 7' high, but it stands 15' above the bottom of the hollow on the landward side. 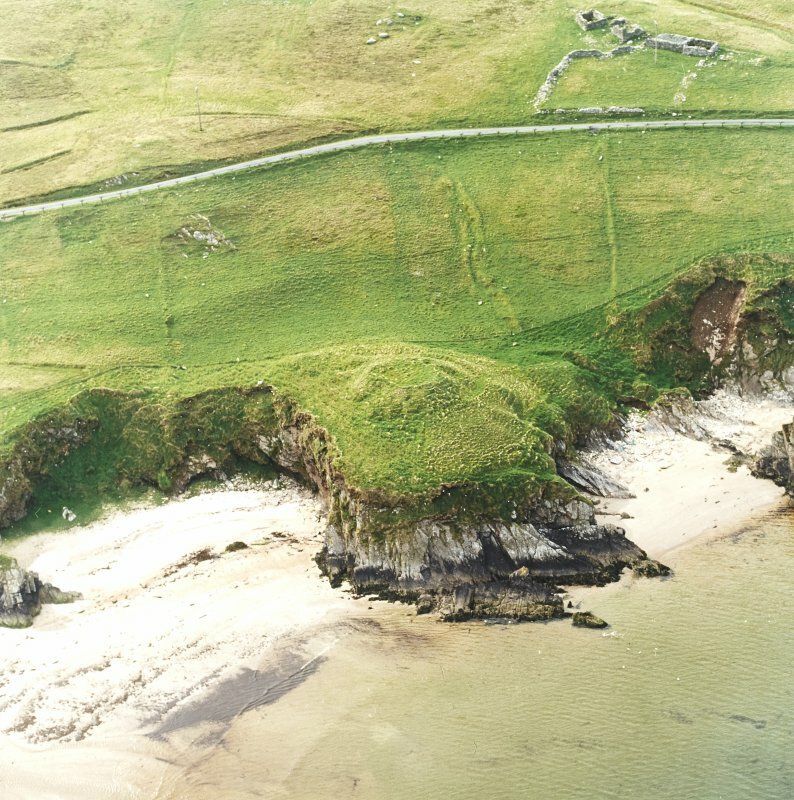 Viewed from the west, the small rocky headland, on which the broch lies, is seen to be defended by certainly one, and possibly two ramparts stretching from cliff edge to cliff edge across its neck, and concentric with the broch mound. 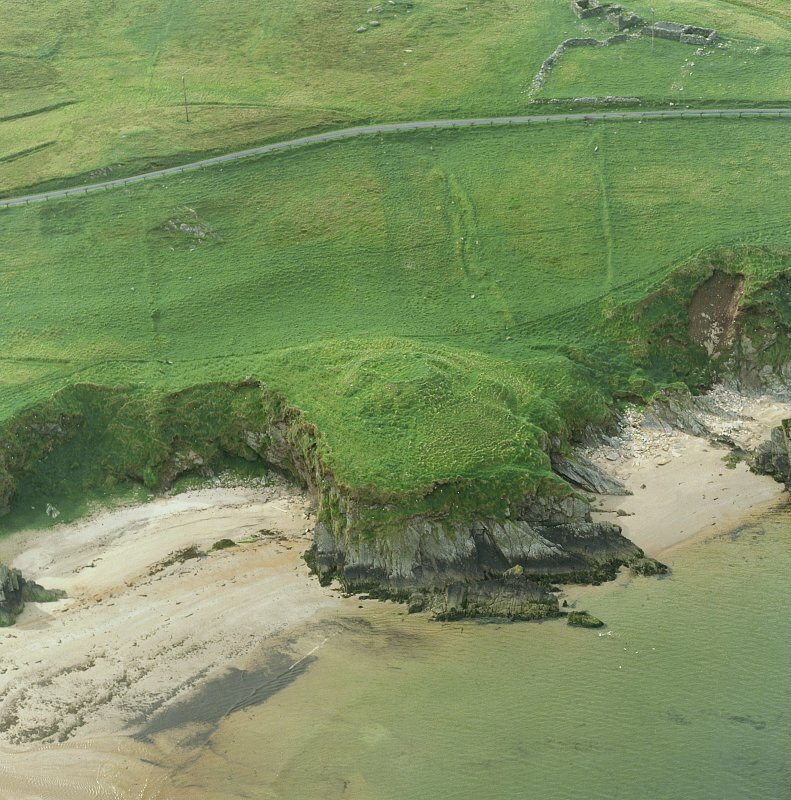 The end core of one rampart is visible in the cliff face on the south side, where erosion has taken place. 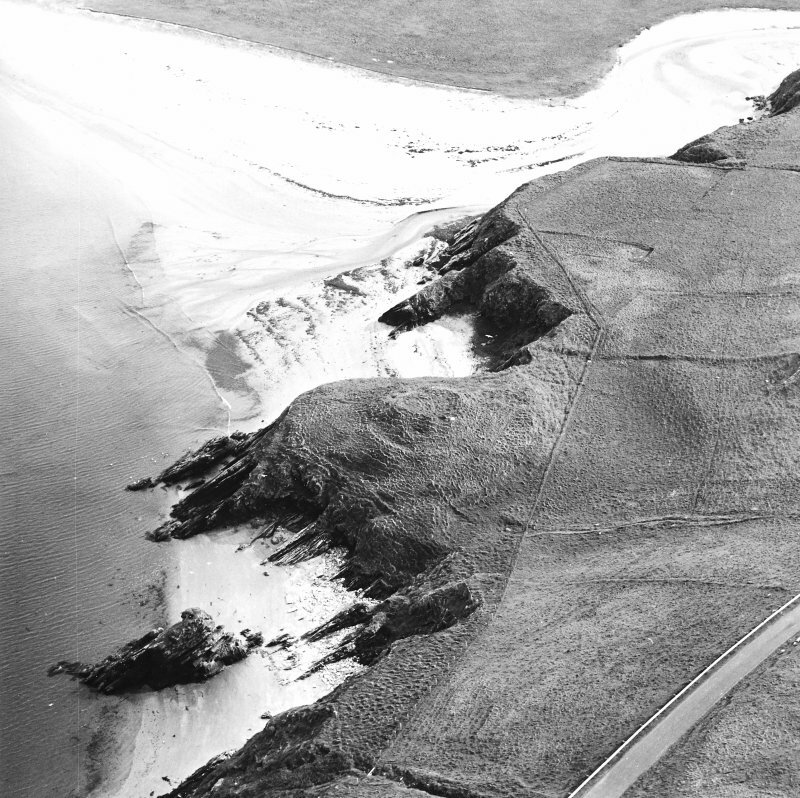 RCAHMS 1946, visited 1930 and 1935. A broch, isolated on a small promontory by a natural gully on the W, as described. Four facing stones are visible on the S arc. There has been some scarping on the W side but there is little evidence of a wall or bank here. The walling exposed in the cliff face on the S side is almost certainly the remains of outbuildings. Visited by OS (RL), 28 April 1969. 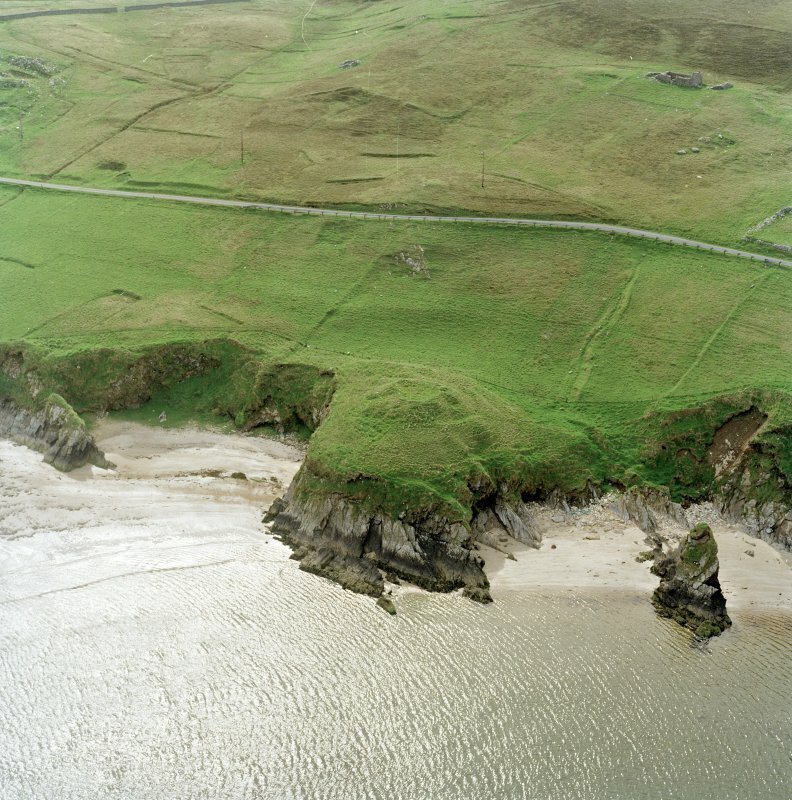 A possible broch on a small headland, Burgar Stack, on Unst. The building is within a circular mound but no masonry is visible; the diameter may have been from 55-58 ft.. 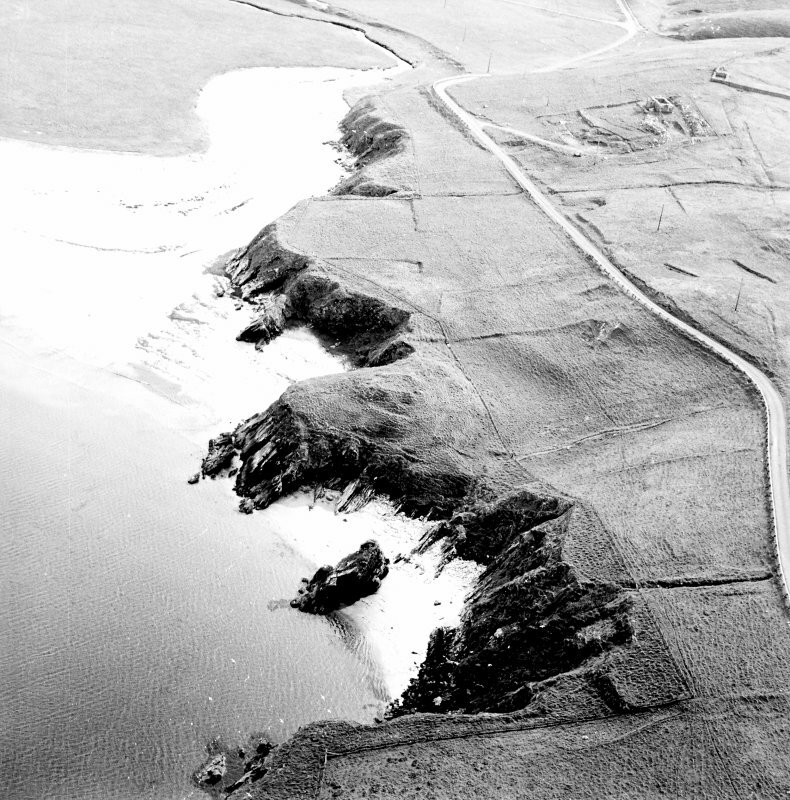 There is certainly one rampart, and possible two, across the neck of the headland. Sources: 1. OS card HP 61 SW 10: 2. RCAHMS 1946 vol. 3, no. 1544, 131.